We have the technical proficiency, professional contacts, and practical experience to determine the most appropriate and efficient systems for you. e heaters, and electric panel heaters. We scale our aircon installation services to accommodate your budget to ensure that you always receive excellent value for money. At Advance Heating and Cooling, we care about maximising the longevity of your climate control investments by sharing maintenance advice and providing access to repair services. Looking to keep yourself, your family, or employees cool and comfortable during the hot, humid summer? You can rely on our professional aircon installation and repair services in Melbourne to keep your units in perfect condition. Having the right indoor temperature is essential for feeling comfortable in your home or workplace. Advance Heating and Cooling is a proud Australian owned family business with over three decades of industry experience in climate control. We offer a range of services from air conditioning installations in Melbourne to repairs, wholesale support, and more. We can organise ducted heating and evaporative cooling units for domestic and commercial customers. If you would like to upgrade, service or fit a new AC system, get in touch with our team today. Replacing an air conditioning system can be very expensive, but it does not have to be. With regular maintenance checks, your unit can last for many years. We highly recommend that you have your heating and cooling systems inspected and serviced every season, especially before summer, to allow your system to operate to its full potential and will not fail you when it you need it the most. Advance Heating and Cooling is the most trusted air conditioning experts in the western suburbs of Melbourne. Our team of qualified air conditioning specialists have worked on many types of commercial air conditioning systems for different types of properties. Our experience and expertise means that we will be able to quickly identify what issues are affecting your unit. Before you know it, your home or workplace will be cool again. We are proud recipients of multiple professional ‘Dealer of the Year’ awards from suppliers such as Carrier, Brivis, and Bonaire. These accolades represent our ongoing commitment to providing exceptional customer service and after-sales support. 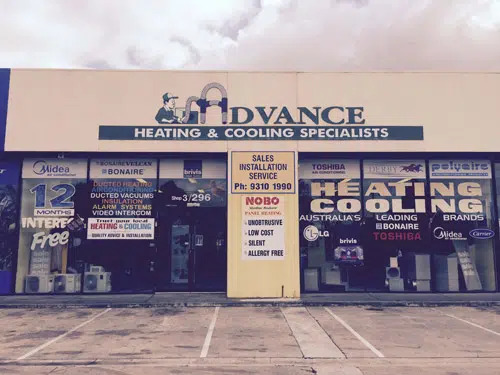 To learn more about our air conditioning installations in Melbourne, contact our team at Advance Heating and Cooling today.